Do you see the little girl in the first picture. 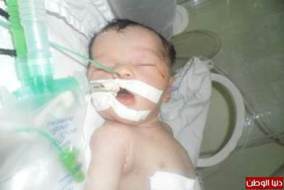 She is Shaima, named after her mother, one day old and despite the tubes, she is in stable condition. Her mom, till yesterday a 9 months pregnant woman, was waiting along with her husband for her first baby to come into this world. Their story never had a happy end. Their house was targeted with two rockets from Israeli war-planes. The mother died, few minutes before reaching the hospital, and once the doctors discovered the baby was still alive, they immediately had her out. Now imagine little Shaima telling the story of how she was born when she is older! I was watching the news earlier and during the live updates of the situation in Gaza Strip, there was a phone call with the general director of the only hospital in Beit-Hanoun, a city located in the north of Gaza Strip. He was sending an urgent appeal, as the hospital was bombed with war tanks. The only hospital in the city, which is crowded with patients, was hit with shells from war tanks. UP UNTIL THIS MINUTE, the hospitals can’t be evacuated…. Finally, this evening, there was a press conference, in front of the central hospital in Gaza city for paramedics. One of them said his name and number and spoke to his colleagues asking them to take the Quran that he always carry with him, and continue with his mission whenever he loses his life on duty. The conference took place after their friend and colleague Mohammed, 32 years old lost his life. 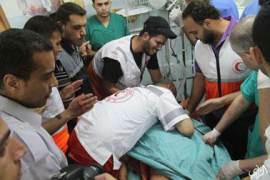 He was targeted with his crew while been on duty, with Israeli war-tanks’ shells. Mohammed is the seventh paramedic to lose his life since the beginning of the conflict. * This article is originally posted Lives Some Live. – This is a 51 day war account of the how daily lives during the third war on Gaza unfolded one day to the next for its devastated and grieving citizens. This is a heartbreaking nightmare. War is not just the numbers nor the political rhetoric it often masks itself in. In the end, it is about people coming to an abrupt end; and the continuum of life stabbed in the heart. In the end, it is about fear; constant fear, till cease fire is declared.